A huge explosion ripped through a chemical warehouse of a dyeing factory in Fatullah in Narayanganj early Tuesday. 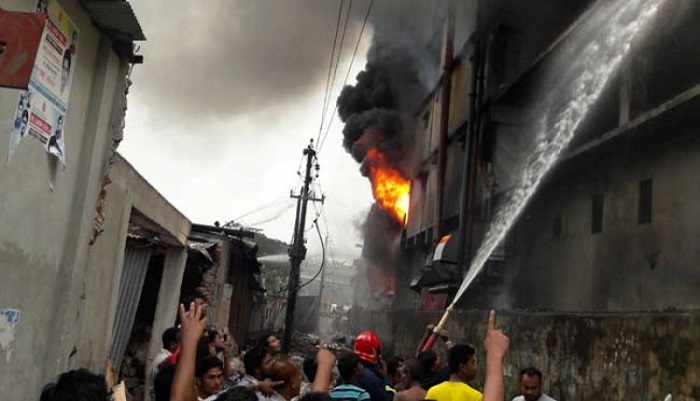 Locals said the explosion that took place at Bombay Dyeing at Bou Bazar damaged the four-storey factory building and several nearby buildings as a fire broke out following the blast. A large hole was created on the ceiling of 3rd floor while walls were blown off and an air-conditioner skidded off the floor. Narayanganj Fire Service and Civil Defence Deputy Assistant Director Al Arefin said the explosion originated at the chemical warehouse on the second floor. Four units of firefighters doused the flame after one hour of frantic efforts, he said.